Do you have a kitchen that could use just a little more lighting? More specifically, task lighting in an area that really needs it, like on the counter top spaces? This posting and accompanying video will help you out should you decide to tackle a project like this. The first step is planning. Do you have a valence under the cabinets, and is it deep enough to conceal some lighting? What type of lighting options you can consider will depend on this. There are many options now available to choose from. The latest technology that I have seen is an LED tape that can be cut to specific lengths and applied underneath the cabinets. Florescent lighting is also a common choice, but depending on the style and type, it can require a deeper valence area to conceal the fixtures from view. In this project, I have about a 1” valence, so I found fixtures by General Electric that would fit nicely in that space, and come in 12” and 18” lengths. They use LED lighting technology, and can be cord connected and plugged in, or can be hard-wired by purchasing the additional kit. They can also be connected together to make the required length appropriate for the section of cabinets that you want to install the lighting under. Every project will be a bit different, depending on your particular situation. In this project I show you the basics of how this task is accomplished, and the typical challenges you may encounter. Watch the video to see some of the challenges you may face in your particular situation. The first step is to figure out where you can get your source of power for the project, and plan how you will get cable run to the fixture locations. In some situations, this may not be possible without a lot of rough-in work, and if there’s not a reasonably simple solution, you may need to consider a plug-in option, or battery operated lighting. In this project I have a two-gang switch that will work nicely. One switch operates the garburator that is on a separate circuit, and the other switch is on the lighting circuit that we will use to power this new lighting. 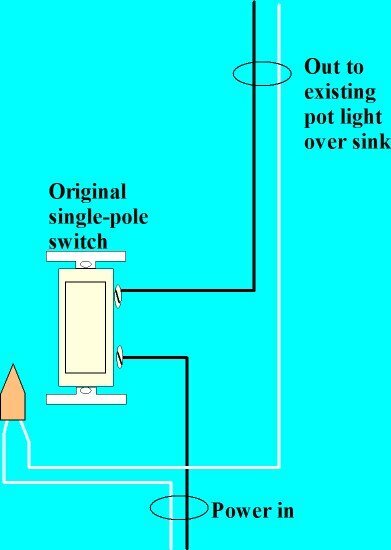 This switch is for a single pot light that is located over the sink area. This lighting circuit had only eight outlets connected to it, so we have plenty of available circuit loading room to add these under-cabinet lights. I have room to change this box out to a 3-gang box, but that would involve a lot of unnecessary work. For about $10 I can purchase a double-stacked switch that is two single-pole switches combined in one device. Because there are now only six conductors in this 2-gang box (power in and out for the pot light, and a switch leg drop for the garburator), I have lots of space to add the four new conductors I need to feed the new sets of LED strips. 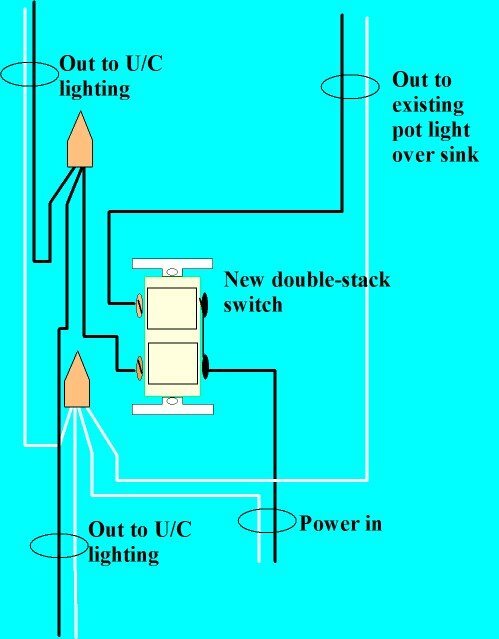 Here is a diagram of how the lighting circuit for the pot light is connected now, leaving out the garburator switch. Once you have chosen the type of fixture to use, you will need to measure and plan how many fixtures, and what lengths of fixtures will do the job. Make a detailed material list of what you are going to need and go purchase your supplies from a good home improvement store. 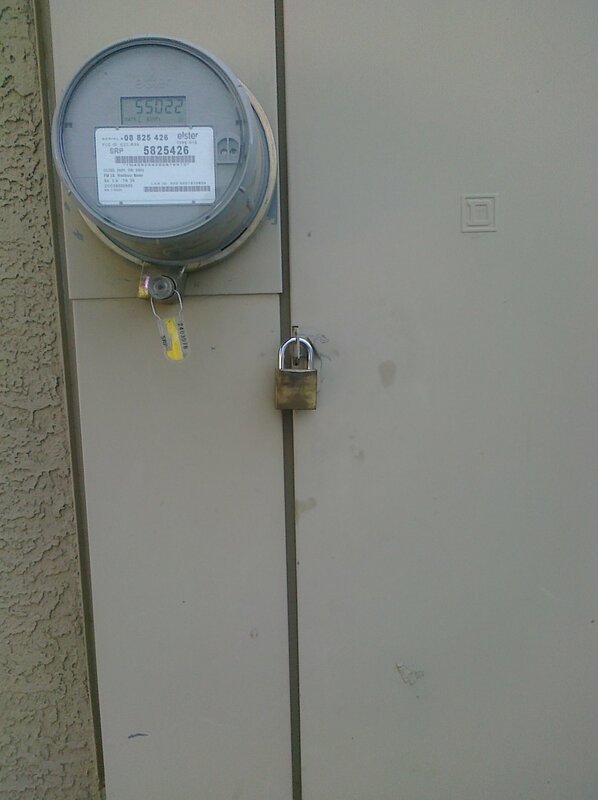 Consider if your cables are going to be concealed completely, or partially exposed and vulnerable to physical damage. Because my feed cables will be hidden, but exposed in some areas, I chose armoured cable (BX), and the circuit is fed with a 15A breaker, so #14/2 flexible aluminum armoured cable is what I chose. When you have everything you need then it’s time to tackle the project. Make sure you allow plenty of time (4-8 hours), and you will make a mess! 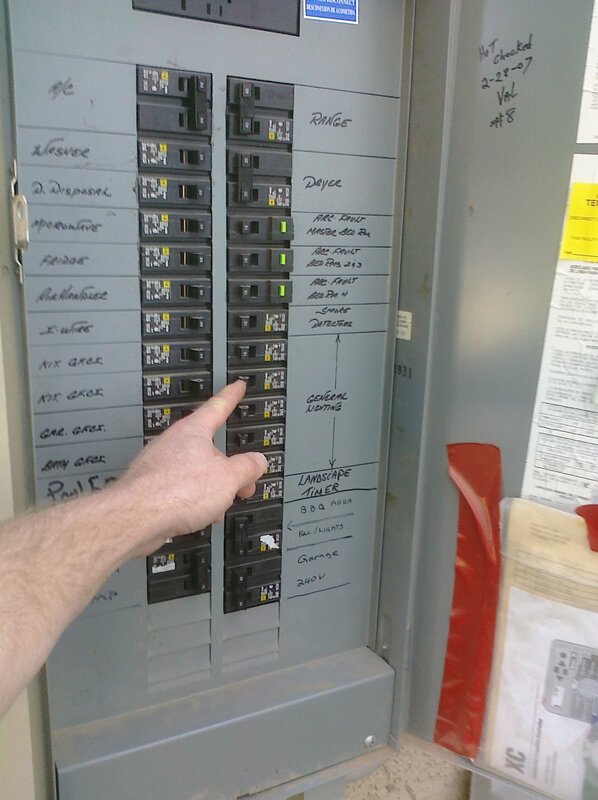 The first step (as always) is to determine what circuit breaker feeds power to the circuit we are working on, and shut off that breaker (refer to my article on safety when working around electricity before attempting any DIY home wiring project). Now I need to open up the junction box and double-check that the circuit is off using a multi-meter, or voltage tester. I also need to shut off the circuit that feeds the garburator to avoid contact with the live wire on that switch while working in the junction box. My first section of LED lighting will be right above this box. As mentioned, every situation will be a bit different, but here I can fish directly up from this box to feed the two 12” strips that will go under this cabinet. I begin by drilling a hole out the back of the valence space into the wall space. Be careful not to allow the bit to penetrate the wall space further than is needed as you don’t want to risk hitting any cables or plumbing that may be in that wall cavity. Now I pry open the available cable entrance in the box that is directly below the hole, and then work on feeding a fish-tape between them. This can be tricky, but with patience, it can be done. Make sure you tape the loop in the fish-tape closed with electrical tape so that it doesn’t get caught up on anything inside the wall cavity, like insulation, cables, plumbing pipes, etc. If all else fails you could remove the entire cabinet and cut a hole in the drywall large enough to fit your hand in if needed. If you need to take this step, make sure the hole you cut will be concealed by the re-installed cabinet! Now that the fish-tape is in, strip the armour from the cable exposing the conductors. Strip enough (8-10”) so that the wires will be ready for connections once inside the junction box. When using armoured cable, make sure you use the plastic anti-shorts that are supplied with the cable or available for purchase when you buy the cable. 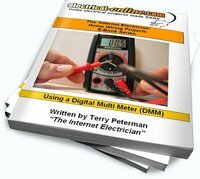 See the video for a more detailed demonstration on terminating armoured cable to the junction boxes. To make things easier to fish in, and because I have lots of room in this box, I’m going to fish again out of the switch box and down under the counter-top behind the dishwasher. Then the cable will run through the cabinets, behind the sink, and behind a drawer on the other side of the sink. Then I need to fish up into the upper cabinets, and then up on top to a new junction box that I will install above the cabinets. From that junction box I will feed cables back down for the lights under the two remaining cabinet locations. With all the cable feeds in place, junction boxes mounted, and splice made, it’s time to install the light fixtures. Follow the mounting instructions provided, and use templates provided for mounting. Measure and space your fixtures evenly, and bundle and fasten any excess fixture wiring up and out of sight as best as possible. With all the connections now made, we can turn on the breaker and test our work. 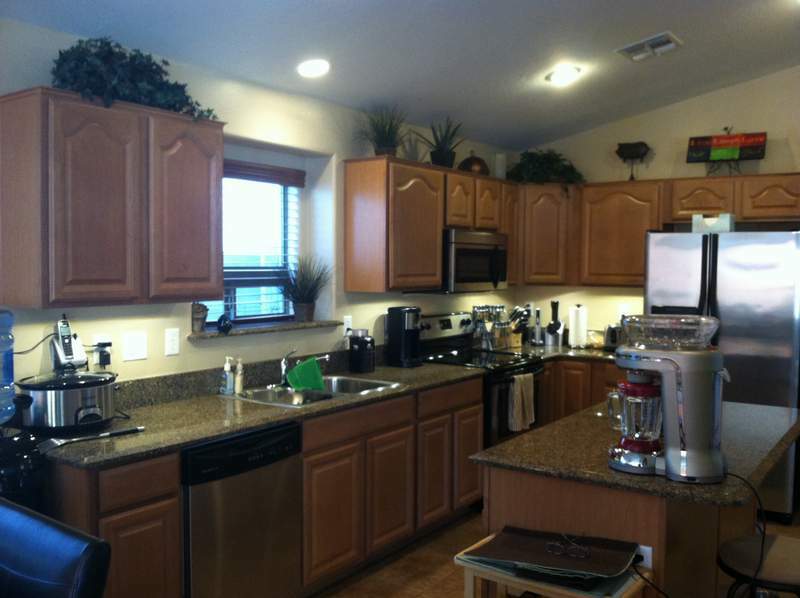 The addition of this under cabinet lighting made a huge improvement to the lighting in this kitchen area. This is a rather large project, but the results were well worth it. Obviously it would have been better if the rough wiring was in place when the home was built, so with that in mind, if you are ever building your dream home, or taking on a major kitchen renovation, include under cabinet lighting as part of your design plans. Remember that this is just an example of a typical project like this, and every situation will be a little different, with it a new set of challenges. However, with the proper planning, and some patience and perseverance, this is something that can be accomplished, and with satisfying results. 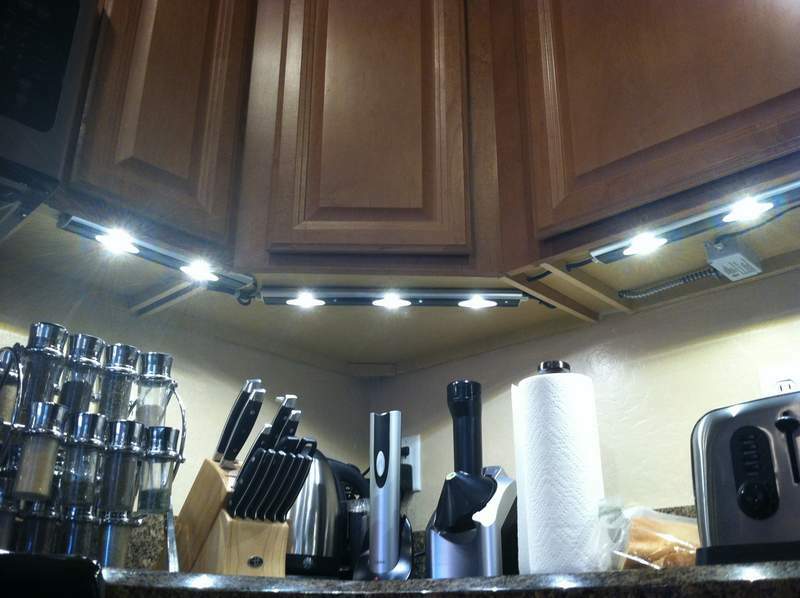 This entry was posted in Home Lighting, How-To-Videos and tagged kitchen lighting, LED lighting, lighting, under cabinet lighting, under counter lighting. Bookmark the permalink.